Sometimes, less is more. Not every business needs a full-fledged website with a 3-tier navigation, a blog and an 5-page “About Us” section. When your business relies more on reputation than on SEO, when the budget doesn’t fit your ambitions, or simply when time is short and you simply have to get that website launched ASAP… Then a single page website might just be the answer. What exactly is a single page website? A single page website, also called a one page website, is exactly what the name says: a website that has only one page. The homepage is the only page. Because sometimes, that’s all it takes to include all the basic pieces of content that a website should include. But what better way to explain it than with some examples from our own portfolio? This Miami contractor needed a modern web presence that they would be proud of when submitting million-dollar proposals to their various clients in Miami-Dade and Broward County. Their previous website (which we developed back in 2009!) was a multi-page website, not responsive and – surprise! – looked very dated. However, because their website needed to be nothing more than a credibility checkpoint, the client didn’t think it was necessary to invest in a large “vanity” website. A single page website was truly the best solution to showcase their capabilities, past projects and offer contact information. Beautiful modern design: there’s nothing “small” about this one page website! A successful business consultant needs nothing more than a solid reputation to get business rolling his way, right? Wrong! Reputation and networking will get you 95% of the way there… but if you show up at a multi-million dollar deal table wearing a suit you bought in the early 80’s, then don’t be surprised if the other attendees exchange confused looks (then pack up and leave). Our client knew that, of course! So he hired us to design an build him a website that represents his business as his online business card, resume, reputation enhancer. If he getting loads more business because his website rocks? I wouldn’t bet our corporate strategy on this statement. But, for sure, no one will be turned off when they google his name and come across this streamlined single page website. His consulting company presents itself exactly as it is: confident, knowledgeable, experienced, trustworthy. No need to hesitate before picking up the phone. 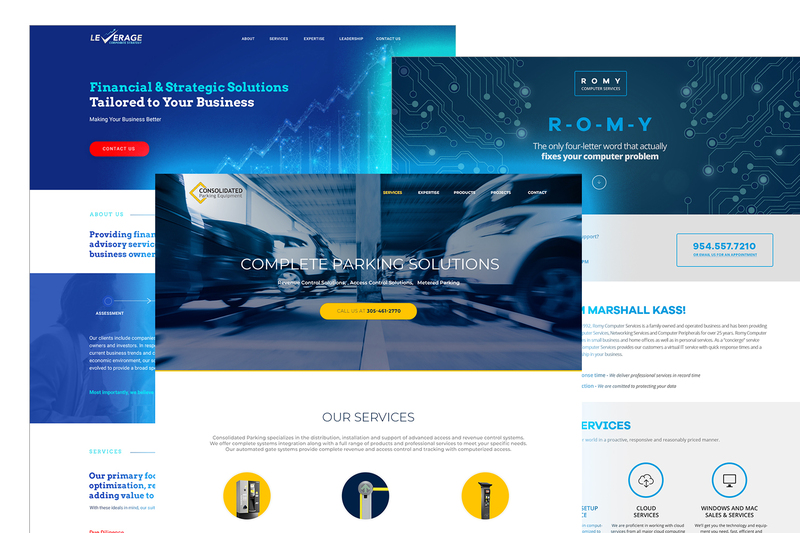 Leverage Corporate Strategy, a business consulting firm based in Coral Springs, Florida, trusted that a well done one page website is better than an artificially enhanced (read: fluffy) website. Well planned structure: a single page website can easily become a mess when it shows large amounts of text; however, with careful planning and great attention to the user experience, we kept the website easy to scan. Simple but bold color palette: blue is corporate, but electric blue is daring; red accents highlight calls-to-action and guide the eye with intention. Sticky navigation: when you have such a long scrolling one page website, you have to be able to navigate the sections without scrolling all the way up. The sticky menu solves this problem. Romy Computer Services is a family business based in Coral Springs, Florida. It’s not a fancy corporation with dozens of employees and impressive adjectives in their “mission, vision, and company manifesto” section. Therefore, a single page website was the perfect solution for setting them up with a modern, easy to use, easy to understand website. All the essentials, none of the fluff. Marshall’s single page website answers a customer’s most burning questions right off the bat: where are you located, what’s your availability, how do I reach you? And, of course, who are you? Credibility checkpoints. The website shows testimonials, certifications, expertise, local “best in business” awards. Practical and useful. More than just an “online business card”, the website also includes links to downloads and access point that Marshall often sends his clients to, as well as a “pay my bill” link. An obedience trainer in Boston needed a simple but effective web presence – so we built him a single page website back in 2016. It still serves him right! A mediterranean food restaurant in Fort Lauderdale wanted a simple web presence to say all the essentials: where & how to find them, and what’s on the menu. We designed their single page website back in 2015 and it’s still as fresh as their Greek salad! Should you get a single page website? You don’t have a lot of content. Sometimes, you might just need a simple web presence and you don’t have a lot of text, images or other content to share. Rather than wait until you magically find the time to produce all that “ideal” content, you might as well get rolling with what you’ve got. You’ve got big dreams on a shoestring budget. We get it, it’s smart business to try and get the bets price for the most value. But sometimes, the reality is that complex 20-page website simply isn’t in the books when your budget is better spent elsewhere. But, while you’re working hard to grow your business, you still need a website. So you might as well get a single page website! If the tradeshow, or that big presentation is coming up and your scrambling to get your startup in shape on time, then you simply might not have the time for a full-fledged website that might take months to put together the right way. A single page website might be just what you need to have a decent web presence. Because done is better than perfect. You sell a single service. Then why complicate things? You might be able to say in a single page website what others are trying to split among several pages. …and don’t rely on SEO or digital marketing in your business. Then your marketing dollars might be better spent elsewhere. A single page website is the most cost-effective solution to get a web presence if you’re not concerned about SEO, content marketing and other digital marketing strategies. We can design a single page website for you, just like we did for the clients above. Check out our price list and then give us a call! What Small Business Website Features Do I Really Need? When Should I Have My Website Redesigned?